A flurry of mail went back and forth over the next few months. He used his best handwriting. I sprayed my envelopes with Emeraude. Hence, the far-away, glazed-over look this Christmas Eve. Scent has a powerful connection to memory in our brains. The sense of smell is sometimes called “nasal nostalgia” because we have strong associations of past memories with certain scents. When God gave Moses instructions on building the tabernacle, He included a recipe for incense (Exodus 30:34-38) that was to be used exclusively at the place of worship. Just one whiff of that spicy fragrance, and the Israelites were aware that they were entering the presence of the Lord. 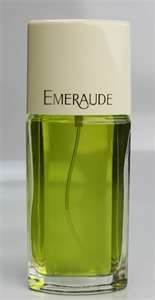 Just one whiff of Emeraude, and PB was back in 1974, falling in love with me. This entry was posted in Devo Drops, Family File and tagged emeraude, perfume, scent. Bookmark the permalink. I LOVE Emeraude!! It’s what I wore when Mark and I were dating. In fact, in recent years, I looked all over for it, but could not find it. Then last year I finally found some and bought 3 packages. My how it brings back memories! There must be something about the Biddick girls using Emeraude to lure their men! (The question is……did I get you started on using Emeraude OR did Mom get both of us hooked on using it??? Seems to me that she used a perfume called Topaz, or something similar). I’m sure I “borrowed” the perfume from my big sister… I thought I’d have to look high and low for it, but there it was…at Wal Mart! I think there will be a post many years from now from one of the Masters girls about remembering “Mom’s smell” as she went off to a meeting. Ha ha… That scent will always remind me of Mom. Didn’t know it held special meaning for Aunt Dinah, too. 🙂 So good to see you and Anna yesterday!!! you are a woman who knows what she wants and goes after it – I am sure it worked both ways! You two are a Great Team and we appreciate all that you both do at Emanuel! You have added LIFE to our people!